This inspirational book enables readers to experience, understand, improve, and embrace life with autism. 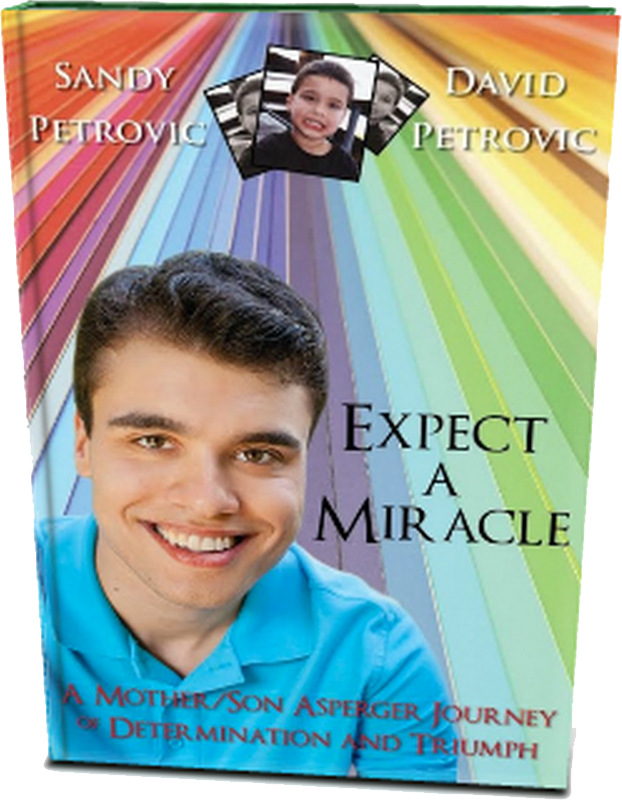 A rare combination in the world of autism books (and Aspergers books), Expect a Miracle was written for BOTH professionals in the field of autism AND persons/families affected by it. Its format allows readers a valuable and unique opportunity to comprehend and appreciate life on the spectrum. But in addition, the challenges and lessons revealed are relevant to other differences or hardships, as well. The juxtaposition of levity and seriousness make this inspirational story a “must read” for persons/families affected by autism or differences, as well as educators, clinicians, health care providers, and service providers. It is also recommended for anyone seeking to learn more about autism and/or creating purpose out of adversity. 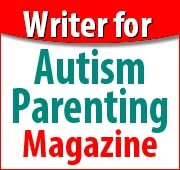 Expect a Miracle has been assigned to aspiring professionals as a “required read” by professors in select college courses; it imparts unique perspectives on living with autism. It is also a beneficial requirement for teen students to learn about acceptance, differences, and treating others with compassion (thereby preventing bullying behaviors). “LOVING IT…excellent job. The students are going to love it too! 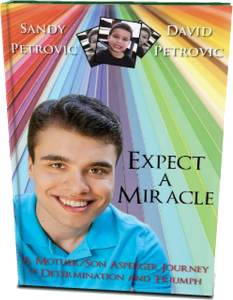 Co-authored from the separate viewpoints of both a twenty-year-old young man on the autism spectrum and his mother, Expect a Miracle makes it possible to experience life from the perspective of a person with Asperger’s, thus enabling its intricate understanding. 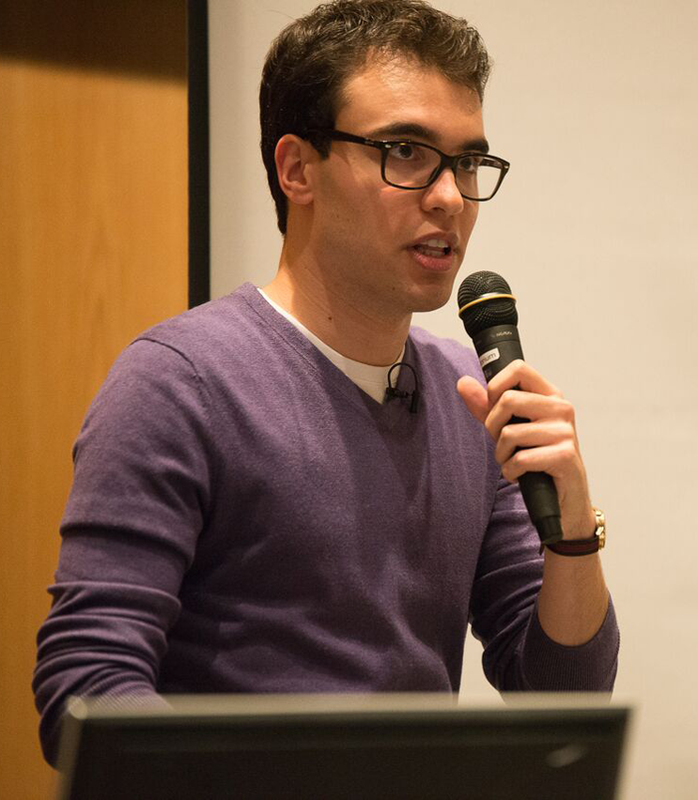 A unique case study, the book chronicles David’s life from birth until successful and fulfilled college living. It reveals every challenge confronted (including bullying), every solution employed, and practical lessons learned along the way. Inspiring hope and ideas, this book would be of interest to those with Asperger’s/Autism Spectrum Disorder, their parents and loved ones, and professionals who teach and counsel them. We are not scientists, psychologists, or education specialists. We are simply a devoted mother/son team who embraced this “trial and error” journey years ago with a relentless determination and tenacity that has not waned. Simultaneous with the realization that David had differences and special needs, I began my search for knowledge, for resources, and mostly—for hope. I was desperate for a guaranteed pathway of intervention and the assurance that my little boy would fulfill his potential and find happiness. There was no such recipe or absolute promise. What we did discover along the way, however, were countless guardian angels, both lay and professional, who added their support and special gifts to the therapies, programs, and resources we utilized. This combination, along with dedication and hard work, resulted in a truly miraculous and inspirational outcome. Challenges still exist, as they do for everyone, but David has exceeded every dream I dared to dream—and continues to amaze us daily with his steadfast determination to achieve his own dreams. The intentions and motivation for this book are numerous. First and foremost, we would like to provide the hope for others that we sought ourselves. Congruent with the claims of experts, our personal testimonials will exemplify that many skills and behaviors deficient in persons with Asperger’s Syndrome CAN be learned. We will show that self-fulfillment and happiness CAN be obtained . . .
. . . Everyone has strengths, and everyone has weaknesses. It must be remembered that even typicals** have social skills flaws—no one is perfect, and everyone has gifts to contribute to the good of all. In addition, it might not be realized that not all the characteristics of AS [Asperger’s Syndrome] are negative: there are some commendable and amazing features that are, in fact, coveted and treasured. The previous statement provides me with the perfect segue to another purpose we have in writing this book. Different does not equal inferior. We hope to stimulate an epiphany of understanding and tolerance for those who are perhaps unknowingly prejudiced towards individuals with differences, with AS being one of them. We implore these parties to rethink their assumption of superiority and to give relationships a chance! Go beyond superficial Asperger idiosyncrasies to explore and connect with the person within—you may never experience more talent, sincerity, loyalty, or unconditional love. So much has been written about individuals with AS having problems with understanding the ways and perspectives of the mainstream. This is my attempt to address the reverse. We aim to educate and inspire the “typical” world’s understanding, appreciation, and acceptance of those with AS.
. . . Though each person with AS is distinct, we hope that there are select anecdotes in this book that resonate with every reader. Our hope is that others may benefit from our experiences. 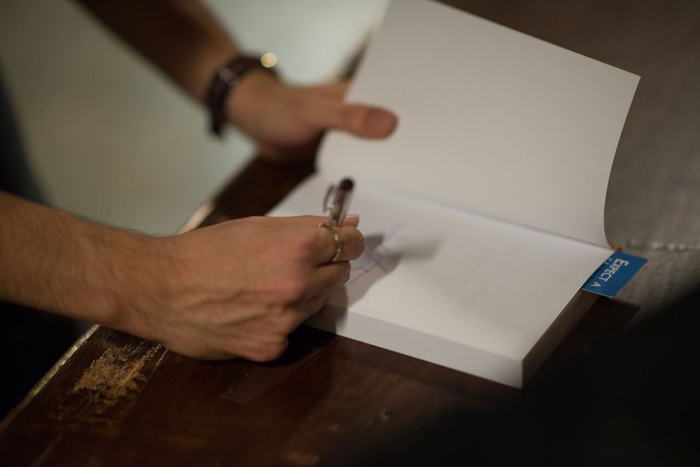 Following each chapter, the “lessons we learned” are a summary of personal convictions and conclusions. They are a subjective culmination of what I have surmised on David’s unique life journey. Some lessons were gleaned the hard way: they were learned from my mistakes or missed opportunities. Others took root from the people, strategies, and occurrences which positively impacted David’s still-evolving success. Surely, readers will not unanimously agree with all of my decisions, deductions, or tactics, but I hope additional avenues for help or improved quality of life may be illuminated nonetheless. . .
**Simply for ease in writing, I occasionally refer to individuals without AS as “typicals,” shortened from “neurotypical,” as frequently seen in other works. I intend no offense with this categorization and hope none is taken. . .
1) Don’t settle for a life that people expect you to live because you have a disability. Go for the life that you “want” and don’t let anyone or anything get in the way of you living that life; I didn’t. 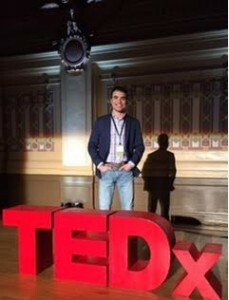 2) I am a person with an exceptionality (key word: PERSON). People with disabilities aren’t mutants or other worldly species; we’re just what we are: people! The one rule I’ve used in my life is the Golden Rule: Treat others the way you want to be treated. Simply, you’re nice to someone, you get it back, and vice versa. At school, the office, and social events, don’t be too quick to judge someone based on what you see on the outside. Take a chance to actually have a conversation starter. You may be surprised by what you learn. 3) Everything happens for a reason! It is my ULTIMATE belief that everything we go through in life has a certain purpose. Whether positive or negative, the experiences that life has to offer make up who we are as people. Throughout this book, you will be getting the perspectives of both the mother and the son. My mom’s views will be in regular print and mine will follow in italics.